Few things are more glorious than a snow day in college. Far and few between, snow days rarely happen, and if you are lucky enough to experience more than one during your college career, you should count yourself fortunate! If you’ve just discovered that you’re the lucky recipient of a snow day, you’ve probably been watching the news all morning long to see if schools in your area were canceled for the day. You more than likely have awaited the call or email from your campus’ security department to hear if the campus would be closed for the day, and when that notification finally came through, there was more than likely a great amount of rejoicing between you and your roommates. Pajamas all day! No school! Free time! Snow days make for the perfect time to hunker down and rest, but if you’re feeling a little unsure about how you can spend your free time, look no further. 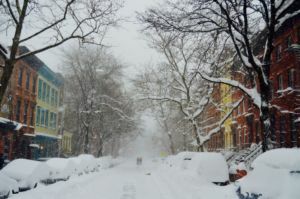 We’ve compiled a list of some great things you can do during your magnificent snow day. No need to arise early and don your stylish but slightly uncomfortable clothing today! Snow days are ideal for staying in your pajamas all day or throwing on some yoga pants and a sweatshirt and snuggling in with some blankets on the couch. Pop some popcorn or bake some brownies, and throw on a Christmas flick or a show you’ve never seen on Netflix, and enjoy your downtime. Is someone organizing a giant snowball fight? Is there a movie marathon going on in one of the rooms in your hall? Is someone throwing an impromptu Christmas party? Grab a friend and roam the halls a bit, or text your friends and see what’s going on. When a snow day happens, there’s usually an almost electric buzz of excitement that runs through the dorm buildings. Take advantage of it and jump on board! Community is a really healthy thing. Do you need to catch up on sleep? Have you been fighting a cold for weeks now? Snow days are a good time to reassess your priorities and take some time to take care of yourself. If you’re someone who struggles with feeling like your wasting time when you lay low for a day, consider the fact that there is literally NOTHING else going on on a snow day. It’s like an extra gift you can simply enjoy. So if it’s needed, take an extra nap and rest, rest, rest as much as you can. Depending on how severe the weather is, pull on some snow pants and a heavy coat, and head outdoors! There are loads of things you can do outdoors in the winter. If there’s a blizzard warning, or you just had a blizzard, there are more than likely a lot of cars that are stuck near your building or covered in snow. Grab a shovel and help dig friends and neighbors out, or lend a hand pushing a stuck car. Other fun ideas: make some hot cocoa and go for a snowy walk with a friend while you enjoy your hot drinks. Grab some sleds and go sledding down a nearby hill. Or keep things classic and build a snowman! He or she will be a monument to this most wonderful day. Do you have a paper due or a test coming up soon? Use part of your snow day to do something productive and get some of your upcoming homework out of the way. While it may not be necessary to work weeks ahead of your syllabus schedule, getting some things done and out of the way during this free snow day could make the rest of your week a lot easier. Again, depending on how bad the weather is, drivers may not be out delivering; however, if your favorite pizza joint or Chinese restaurant is open and BiteSquad and DoorDash are open for business, it can be fun to pool your money with friends and order some warm, delicious food! Have a picnic on your living room floor with your comrades and enjoy the bounty!